Do you ever get your best ideas in the shower? Aqua Notes came up with a clever idea... a waterproof way to jot things down, you learn more about them here. Awesome. I think I'd use these to leave myself reminders in the morning. How rad is this? Love it! I am a list maker- I think this could be dangerous for me! brilliant!~ i get the best ideas in the shower! I don't know how that works, but it's amazing! genius idea! how does it work? this is such a great idea! One of those "why didn't i think of that" things. What would also be fun is just being able to draw right on she shower tiles (provided it doesn't stain the grout). Think of the art you could create! this is so great! I do come up with a lot of ideas or things I MUST DO when I'm in the shower/bathroom (must be all that white noise) and the minute I step out, all those ideas and things to do disappear.. so smart whoever thought of this! 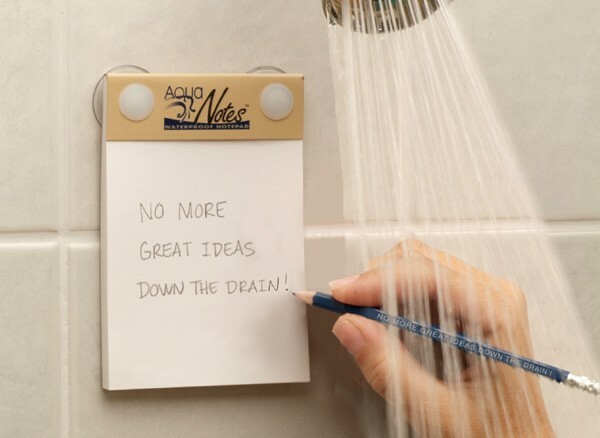 amazing...why do so many good ideas come in the shower...werid! I definitely come up with my best ideas while showering...and driving. This is brilliant!! haha. i don't have enough thoughts going on in my head to write it down that early in the morn. Love this idea, I tried doing something similar by having a notepad on my bedside table incase I have any ideas as I'm nodding off. It just ended up with indecipherable scribbles!